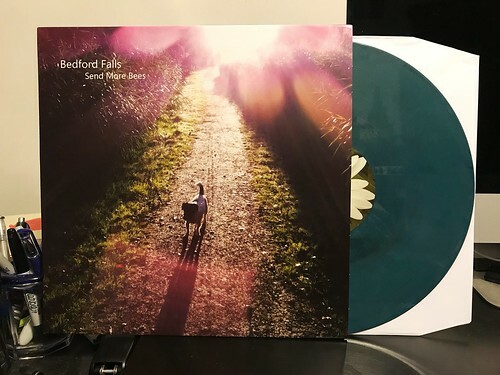 Send More Bees is Bedford Falls' third album, but for whatever reason it's the first one of theirs that I've heard. No matter how much I'd like to think I stay on top of things, at least within the genre of music I tend to like the most, bands like this still slip through the cracks. I'm not entirely sure how I've missed Bedford Falls until now, but I'm happy to be correcting that problem at last. Bedford Falls are playing a slow burning slice of the fuzzed out bliss of bands like Superchunk, but with a lower key take on the proceedings. The bulk of the songs take mid tempo pace to allow the vocals melodies and lyrical imagery to really take hold. Taking a more measured approach does give everything a bit more room to breathe and some of the songs flourish in this atmosphere. If there's a criticism, it's that the first batch of songs tend to somewhat blend together a bit, but it also makes the songs were Bedford Falls step on the gas, like "Reason To Believe" and "Defeat Artist" stand out more. These songs take on a dynamic, Starmarket-like feel and the energy builds and the vocals have a focused urgency to them. I do tend to prefer the faster ones at the end of the day and wish there were a few more over the course of the album. Still, when Bedford Falls are on, they are really on and it's an album absolutely worth checking out.